Beacon Falls, CT – January 2, 2014 – The shiny new TT-756 dryer from Lavatec Laundry Technology (LLT) on display at last summer’s Clean Show held down the street from the home of the New Orleans Saints, now works near the home of the Fighting Irish, in the shadow of Notre Dame University’s Golden Dome. Here, advanced technology and efficiency go hand-in-glove with speed and accuracy, helping South Bend, Indiana-based Ziker Uniforms grow its business profitably. "It’s doing what they said it would do," reports owner David Ziker, the third generation leader of a company his grandfather started in 1917. Ziker says the 450-lb. capacity LLT unit will dry loads "in about half the time" of the nearly 20-year-old dryer it replaced. Not only does it use much less energy, it does so consistently and reliably. Ziker Uniforms production manager Andrew Mortek (left) and owner David Ziker report the new TT-756 dryer from Lavatec Laundry Technology (LLT) finishes loads in "about half the time" compared to the unit it replaced. This kind of performance is critical when serving Ziker Uniforms' 800-some customers in northern Indiana, northeast Illinois and southwest Michigan (www.zikeruniforms.com). A second, separate area in the same 70,000 sq. ft. facility at 251 E. Sample Street processes goods for Ziker Cleaners, which has eight retail outlets throughout the area. 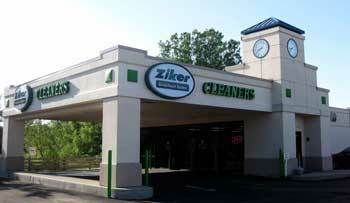 Ziker Cleaners employs 70 while Ziker Uniforms has 50 employees. 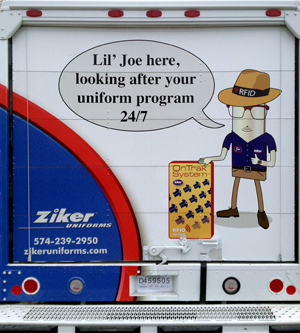 "We’re a specialty industrial uniform rental company for small and mid-sized businesses," Ziker explains. "Our rental programs cover a variety of industrial operations, auto repair, manufacturing, construction contractors and more. We process about 4 million pounds of laundry annually, mostly pants and shirts plus mats, shop towels and other partner products." Most customer pickups are weekly with a one-day turnaround, and Ziker’s advanced OnTrak system featuring UHF RFID is unique in his market area. "Customers take pride in the smart, professional look of the branded uniforms we provide," Ziker observes. "It’s also good business. Uniforms help them generate trust among their clientele, and helping them consistently present a fresh, positive image is where our laundry operation comes in." Along with the new LLT TT-756, Ziker Uniforms’ semi-automated pocket system includes four 450-lb. Lavatec washer extractors, a shuttle and a second 450-lb. capacity dryer with about 16 years of service. As one would expect, the latest arrival sets the pace. Over 800 businesses in northwest Indiana, northeast Illinois and southwest Michigan rely on Ziker Uniforms to deliver freshly laundered, image-enhancing branded outfits for their employees each week. "The new dryer gives us a lot more control compared to the usual time-and-temperature method," asserts Ziker. "You can program the TT-756 using the touch screen. Just pick a formula number and set parameters for the load – pants, for example. If you want the fabric to be 150° F, the infrared sensor will tell the processor when it reaches that point. The computer will put the dryer into cool-down and finish the load, whereas a timer might keep it running for another 10 minutes or so. "This saves us time as well as energy. In addition to reducing our gas bill, shorter drying times give us more capacity." "A big issue in drying is air flow," Ziker points out. "You’re moving a lot of CFM (Cubic Feet per Minute), and you want it directed to where it will do the most good." This is also an area where LLT engineers didn’t overlook "low tech" items and daily laundry activities that impact dryer performance. "Older dryers had a barrel-like lint screen that slid in and out at the bottom, with padding around it to provide a tight seal," Ziker says. "The trouble is, the padding could easily catch or rip. When it was then (sometimes forcefully) reinserted, the airflow was diffused where air and lint escape." Ziker Uniforms’ headquarters in South Bend sits in the shadow of the Golden Dome at Notre Dame University. Lint screens for the TT-756, however, are flat and inserted at an angle. "You can simply open the door, clean it off with a broom, close the door and bam, you are done. It’s quicker and less chance for operator error to mess up the airflow of the dryer." Most laundry equipment maintenance and servicing are done in-house, Ziker says. LLT has been responsive when called upon and "they handled a couple of other things when they installed the new dryer. Beyond that, our maintenance technician is experienced, has been to the Lavatec Maintenance School, and also consults with LLT specialists via phone to help troubleshoot a problem, replace a part or otherwise keep our system up-and-running." While fast processing without downtime delays keeps each customer’s rental program on track, Ziker’s Radio Frequency Identification (RFID) system keeps tabs on every item. "The number one problem customers have with most uniform programs is that you don’t get back what you turned in when you send it to the laundry," Ziker contends. His company has this issue covered in spades with "OnTrak," the Ziker moniker for its item-specific tracking system. "We’re the only uniform company in this region using new-generation UHF (Ultra High Frequency) RFID to keep tabs on every single item, from our soil dock all the way back to the individual customer. Each pair of pants, each shirt has its own unique ID, and the location and status can be called up and verified in seconds. "This new-generation technology can multi-read, which speeds up our sorting system. We can put soiled uniforms from the truck right into sling bags, send them through a portal and it reads a whole sling bag at once, instead of having to read garments one at a time with a scanner or on a conveyor." If an item doesn’t have a tag or it’s damaged, Ziker says the system won’t recognize it as part of the batch. The uniform will be easily identified at the first sorting station where it will be quickly tagged and reinserted. UHF RFID is far less costly than scanning bar codes, and it has a much higher read rate. "The ultimate winners are our customers. They can count on getting back the exact items they put in – clean, fresh and on time." 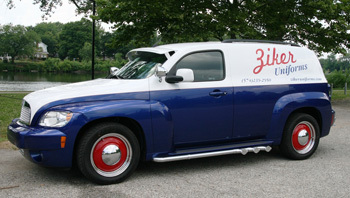 One of three customized HHR (Heritage High Roof) cars is modeled after 1930s era delivery trucks and used to make service calls. As the calendar turns, the new LLT dryer is performing as expected, boosting productivity while saving energy and helping to ensure timely turnaround for customers. "2013 was a good year," sums up the ever-optimistic Ziker. "We took a hit in 2008-2009, as did just about every business in the country. Now we’re back to where we were and moving up. Continuing to find and employ advanced technologies will help us not only maintain, but sharpen our competitive edge for even better years to come." Delivering dependable commercial laundry equipment engineered for higher returns throughout their lifecycles has been Lavatec Laundry Technology’s (LLT) mission statement. 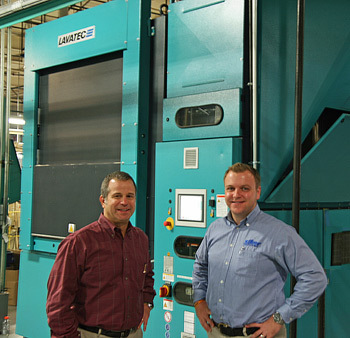 A rarity among manufacturers of continuous tunnel washers, Lavatec LT offers center transfer, bottom transfer and double-drum construction options, plus a full range of readily integrated, end-to-end laundry system components: washer extractors, extraction presses, centrifuges, dryers, conveyor systems, pickers, feeders, ironers and folders. Simple design, durable construction, user-friendly operation and low maintenance are hallmarks of Lavatec LT machines. A global leader with equipment in laundry operations throughout Europe, the Far East, South and North America, in the United States alone, over 6,000 Load Warriors are in place. For additional information, visit www.LLTusa.com.